If the universe were a block of Swiss cheese, the Milky Way would sit within one of the cheesy holes. Earth is pretty insignificant. Though once thought to occupy the hallowed center of our universe, researchers now know our planet is just one of billions upon billions out there. But it gets worse. A new study strengthens the notion that our home galaxy is breathtakingly remote in the universe. As Ethan Siegel reports for Forbes, we are likely floating within a cosmic void that spans roughly one billion light years across. The idea that we live in the “celestial boondocks” was first proposed in 2013 when University of Wisconsin-Madison astronomer Amy Barger and her then-student Ryan Keenan found that the density of the nearby universe is lower than other parts of the universe. As Siegel explains, when examined on the grandest scale, the density of the universe—all the galaxies, gas clouds and other space stuff—is pretty uniform. But if you zoom in on smaller and small sections of space, it is organized more like cosmic Swiss cheese, with matter pulled into dense filaments full of galaxies. Between these filaments are large voids which are not completely empty, but are much less densly packed. The giant cheese-hole that we may live in is called the KBC Void, named for Keenan, Barger and astronomer Lennox Cowie. The new research, presented last week at a meeting of the American Astronomical Society by Barger’s student Ben Hoscheit, strengthens the evidence that we live in a big old hole. Hoscheit tells Smithsonian.com that to test this cheesy idea, he looked at the tension between two measurements of something called the Hubble Constant, which describes the rate at which the universe is expanding. As a physical constant, the number should be same throughout the universe. But when astronomers measure it by looking at the movement of type 1A supernovas—or exploding stars—relatively close to Earth they get one number, known as a “local” measurement. Whereas when they measure the constant using the cosmic microwave background (CMB) radiation, a leftover from the Big Bang that pervades the universe, they get another result, known as the “cosmic” measurement. 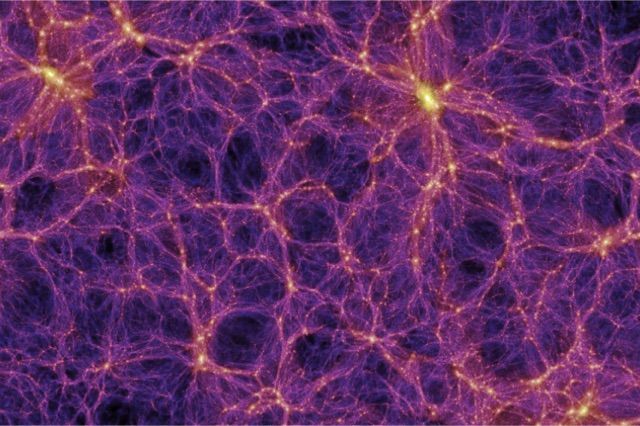 Siegal explains that if we were located into a more metropolitan area of the universe, say along one of the filaments, the apparent expansion of the universe might look slower since higher amounts of gravity would effect how quickly local objects move. According to a press release, the researchers believe the void is spherical and seven times larger than any other void measured so far, more than 1 billion light years across. The KBC void is believed to be surrounded by a shell of galaxies that increases in thickness the farther out it stretches. Our galaxy is a few hundred million light years from the center of the void in a supercluster of galaxies called Laniakea. This diagram covers nearly a billion light years of space. Don’t forget where we parked. Illustration by Daniel Pomarède, from the Vimeo video. Without taking some sort of cosmic selfie, taking these measurements is the only way for astronomers to confirm the presence and define the structure of the universe. And Hoscheit says his team is continuing to refine previous observations and to take more measurements.